Southern Anesthesia and Surgical 222 Information | Southern Anesthesia & Surgical, Inc.
Avoid having your form returned. We're here to help, call our DEA Compliance team 888.222.3722. If you do not have 222 forms, you will need to go directly to the DEA Website to order. DEA requires that your 222 form address be the same as the address on your current DEA Certificate. 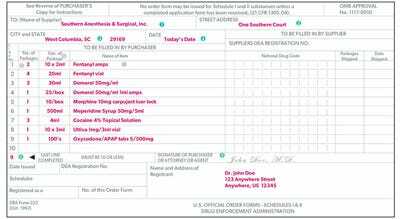 DO NOT fill out suppliers DEA Registration No., National Drug Code, Packages Shipped and Date Shipped. This information will be completed by Southern Anesthesia & Surgical, Inc. Any Questions? Call us at 1.888.222.3722. Name of Supplier: Southern Anesthesia & Surgical, Inc. Mistake anywhere on the form? You will need to VOID your entire form, keep it on file and start with a new one. Please do not write over mistakes in an attempt to correct. This is considered an alteration. We cannot accept forms with alterations or errors.